I live in Evanston, Il where I was born and I’m married to fellow Evanstonian, Bob. I have two children, one of each, and a stepson who has made us grandparents. We have a parakeet, a cat and a puggle. I have lived in Iowa, Boston, and Wales, UK during my student and post-student years. Where did you get the idea for The Ghost and the Bridegroom? All of the stories in this anthology are connected by a paranormal detective agency. Somewhere at the beginning it was suggested this agency is like the Pinkerton Detectives, so I thought it would be fun to have my agent meet a Pinkerton detective while they are staying at the same hotel in Tucson while working on separate cases. They fall in love, of course. Not really sure how I came up with the rest of the story. I thought it would be interesting to have my rather socially awkward young lady detective find herself put on a case where a rancher is unable to consummate his marriage to his mail-order bride because he’s being terrorized by a ghost in the bedroom. Eventually the case the Pinkerton is working on intersects with the case my agent is on. My story is more humorous than scary. I usually write historical westerns or contemporary. I never wrote a paranormal story before, but I was excited to be asked to be part of this anthology which is a collaboration between western and paranormal authors. Yes, at the suggestion of one of the other authors I named my heroine Healy Harrison after my daughter. When she was born I wanted to give her more than her father’s father’s surname. So Healy is the maiden name of my great grandmother and Harrison is the maiden name of my mother-in-law. I thought I was being clever, but the poor girl has to go through life correcting her name because everyone calls her Kelly or something similar. The same thing happens to the character in the story. I think everything that comes after writing the book is the hardest part, starting with what to do with it once you write “The End.”. I write for Prairie Rose Publications for my historical westerns and medieval romances. I’ve also self-published a number of things. Keeping up on all the social media sites alone is time consuming. And then there is the promoting…Thank you Alicia! I really love Tucson but as stated earlier I live the Midwest. I also live in the 21st century with the rest of you, not 1880. So trying to get the setting right for this book was a challenge. I mean, I don’t want folks from Tucson coming back to me and telling me I put the streets in the wrong places. I was trying to find maps, etc. when something fortuitous happened. Some man on Pinterest messaged me to say he had boards devoted to late 19thc Tucson and he invited me to repin. He had so many photos and maps! We didn’t even follow each other so I don’t know how he found me and I haven’t heard from him since. Thanks to him, I could be more accurate with streets and buildings. He had a great photo of a Chinese laundry across from the train station, which I put in my story. People who know me are probably sick of hearing me say this, but I’m a big believer in walking. I find an hour long walk at the start of my day stimulates my creativity. I do much of my “writing” while I’m walking. And because I do not have a fenced in yard, but I do have a dog with a small bladder, I’m frequently taking more walks during the day. It really clears my head. People who know me are probably sick of seeing me walking by their houses ten times a day. While I was writing this story I had Irish actor Aidan Turner in mind for detective Aaron Turrell (see how I did that with the name). If you don’t know him from the Hobbit or Poldark, he’s tall, dark and handsome. Since the heroine is based on my daughter, I’d cast her, and then she’d get to meet Aidan Turner. Oh, good question! I make such delicious heroes; I’d be happy to be any of the ladies in my books. But, there is one book very close to my heart, Patrick III. It’s based on a trip I took with 3 generations of my family to Newfoundland to discover our roots. Even though the book has nothing to do with that trip other than I liked the dynamics of generations of a family traveling together outside their usual roles, I did weave in some personal experiences–including finding a small town named after my family. It was full of Healy’s and Nugents (the other Newfie branch of my family) who never left Newfoundland and remain in situ (they welcomed us with open arms). There is more of me in the main female, Gwen, than I usually put in a character. Plus, I think the hero, Patrick, is one of my favorite creations. He’s a solid, reliable guy, who’s taking some personal time to reevaluate his life. He and Gwen keep crossing paths on the island as they are each on their own quest. Eventually Gwen ditches her family and spends a glorious time riding out on the back of his motorcycle, doing outdoorsy things like hiking and kayaking during the day and ending their excursions in fine hotels and restaurants. My dream vacation: I’m an active person but I’m not going to sleep in a tent. If you could spend time with a character from your book, whom would it be? And what would you do during that day? One of my favorite characters is Des Costello in Love with an Expiration Date. He’s dynamic, charismatic, and has a wicked sense of humor. He’s an independent filmmaker who lives in Dublin. He’s kind of a player (he’s been wounded) but when he meets a visiting American English professor, he falls head over heels. His mission becomes to make her fall in love with not just him but Dublin as well so she’ll stay. I’d love to walk around the city with him or visit the pub. He’s so charming. I could talk to him forever. Probably like most authors, I love to people-watch. I’m also a shameless eavesdropper, so I store bits of things I’ve seen or heard in my head. But really I make up my characters. Though on two occasions I woke up from vivid dreams where I saw a scene with people I didn’t know. I based two books, Love with an Expiration Date and Pairings, around the snippets I dreamed about. My friends and family are very supportive and my biggest fans. Big shout out to my husband for letting me disappear hours a day doing dubious things with my time and who also helps me with technical stuff. My friends are my beta readers and have always encouraged me from the start. Coming up with titles is a challenge for me. If I ever strike it rich I’d hire someone to think up titles for me. Then I’d hire another person to write blurbs. Because this story is a detective story set in the past, I wanted to give a nod to the classic detective novels whose titles started with “The Case of…” Originally I was going to call my story The Case of the Ghost and the Bridegroom. But because my own name is long enough, I didn’t want to eat up the cover with text. I also didn’t want to type the longer title every time I had to refer to it, so I chopped off the first few words. When you start reading a romance novel and the Hero first appears what qualities about him hook you into the story? In this excerpt agent Healy Harrison meets the rancher for the first time and learns about his haunting. 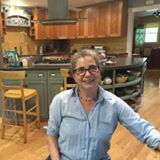 Patti Sherry-Crews lives in Evanston, IL with her husband and two children. She writes both contemporary and historic romance. Under the name Cherie Grinnell she has written a series of steamy romances set in Dublin and Wales. She likes to include armchair travel with her books. Thanks for all your kind words, Monique. I know the social media…and they keep coming up with new sites. Nice to meet you too! Hi, Alicia, thank you for having me over again today! This was a fun anthology to work on. 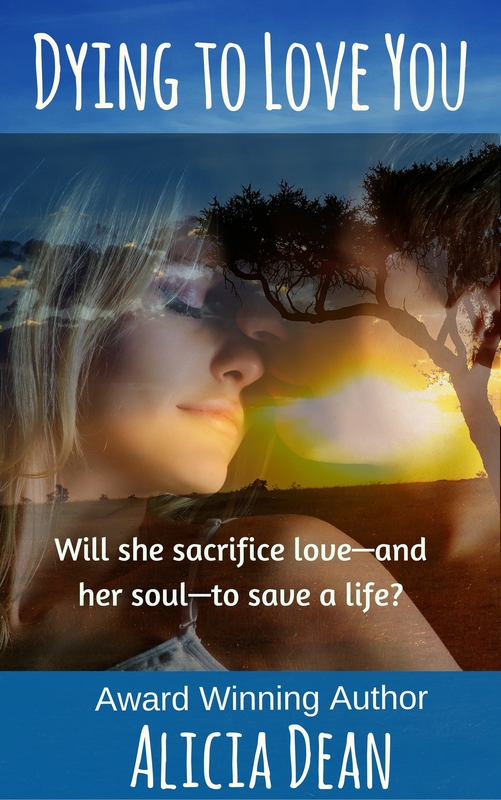 Collaboration between paranormal writers and historic western romance writers. I think there’s something for everyone in this boxed set. 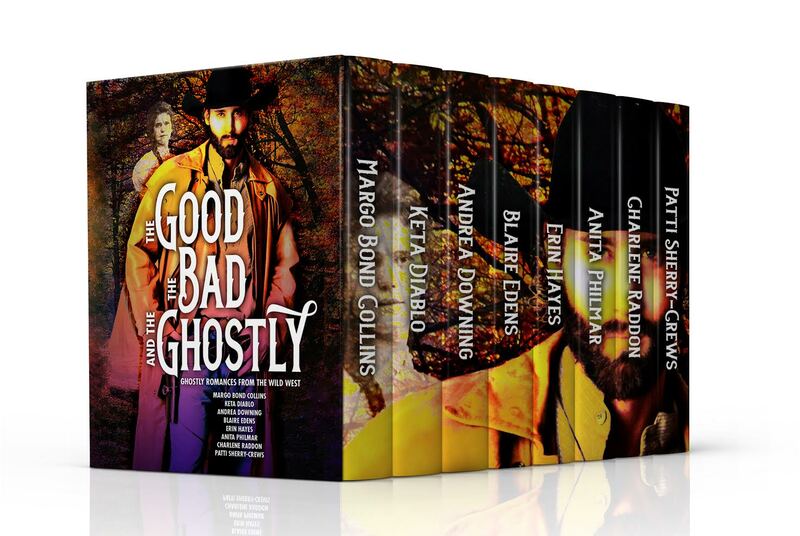 HI Alicia, thanks so much for hosting Patti today and letting her share her adventures with being one of the authors on The Good, The Bad and The Ghostly. I enjoyed working with her, as I did with all the others, and hope your readers will give the boxed set a try. Sounds like a wonderful job with cross genre! Best wishes for success. Love Aidan Turner in Poldark. (Can’t wait for the next season to start.) Your story sounds so interesting. I don’t usually read ghost stories, except Alicia’s, of course 🙂 But this sounds like fun. Best wishes. Thanks, Diane! I had a blast writing this story. Rather than attempt to compete with the paranormal gals, I went with humor. But there is something for everyone in this set including time-travelers. Aidan…. Wow, what a great interview Patty. I have to agree with you coming up with a title can be a challenge. Thanks for hosting the box set, Alicia. You are the best. Hi, Maureen. Thanks for stopping by. I had fun working on this anthology. It’s always interesting to see how a group is given a starting concept and where everyone goes with it. A very diverse collection of stories here. What a cleaver idea for a story! I love it! Best to you and wishing you much success on The Ghost and the Bridegroom! Thank you, Darcy! I accept all good wishes. I’m glad you stopped by today. Great interview! Your book/story sounds really different and intriguing! I’m glad you stopped by today! Some of the authors in this anthology had there characters interact, so it was fun to read and see agents popping up in other stories. I had the task of creating a central office for authors to use if they wished. I think it’s a unique idea. You had my attention from the word “ghost”. I enjoyed the interview, the excerpt, and think I may have to check this anthology out. Thank you, Linda! I hope you do check out this anthology. Each author has their own voice and take on the agency–something for everyone! Oh, how funny. Loved the excerpt! Great job depicting his (and her) embarrassment! Had to look up this Aidan Turner character. Nice looking! And he has a lot of different looks, too. Enjoyed your excerpt! Fun! Hi, M.J. I’m glad you enjoyed the excerpt! If you watch PBS Aidan stars in the Poladrk series–the remake. Fellow TGTBTG author Andrea Downing and disagree about who is the hottest Poldark. She likes the actor in the original series better. Oh, well, I love tall, dark and handsome. Thank you, Leah! glad to hear I tickled your funny bone. The characters find themselves in a number of embarrassing situations in this story–I made sure of that! It was fun to write. Hi, Leah! I had trouble replying to your comment (it seemed to want to pop up elsewhere). If it doesn’t show up here, thank you again for your thoughts! I set up a lot of embarrassing situations for those characters to deal with. But I did give them a happy ending. Love Pinktertons! Such an interesting part of history. The book sounds great! Good luck to you! Hi, Kara, thanks for stopping by! We did post the Pinkerton Code to our group files. I read up on them as part of my research. They did have the first female detective in the United States, Kate Warn. Patti, so good to learn more about you. Love your story. thanks, Char! I loved the time travel element in yours. Great interview and excerpt. Love your voice. Best of luck with your book! Thank you, Marissa! I do appreciate you taking the time to comment. Alicia’s blog is always a good place to be. Best to you! What a fascinating and original story this sounds. Very interesting interview, and I was also interested to learn you have lived in Wales – my homeland, I am from wild West Wales on the coast,I’d love to know what part of Wales you studied at. Hi, Hywela, what a pleasure to meet you! I did look at your name and wonder. What town are you from? I went to U of N. Wales in Bangor for a year (where I studied Welsh among other things). I spent many happy days exploring towns like Conwy, LLandudno, and Betws y Coed. My favorite was to walk over the Menai Suspension Bridge to the Isle of Angelsey and tromp around Beaumaris Castle. Years later I had an Irish and Brirish import store and on a buying trip visited South Wales for the first time–lovely! If you visit my author website you will see I wrote a steamy romance, Pairings, set in Wales under my pen name, Cherie Grinnell–it may be the only book of its type set in Wales! Pairings is one of my favorite books, and I’m going to rewrite it in the near future to make it more mainstream and put it out under my own name–it’s very funny, so I hear. Thanks again for stopping by.